Some dentists really can’t help themselves. I recently heard about a dentist who was having a disagreement with his team regarding continuing education for team members. The question arose because the dentist was having some of his team members doing dental courses and modules on their own time, and he was wondering whether or not the team members should be reimbursed for their time spent learning. It’s a good question, especially in the case when the dentist and the practice have asked the team members to participate in this type of learning. And sure, the staff benefit from the added knowledge they acquire, and they can take that knowledge and those skills away with them if and whenever they decide to move on…. But, and it is a big BUT, so too does the dental office and the practice owner benefit from the skills developed by those team members. I guess in the mind of the dentist, the thought of non-payment of staff for their time spent studying, comes from the fact that as a business owner themselves, they are never paid for their actual time spent in attending courses and learning. And as you would expect, doing that additional learning usually takes the business owner away from doing the things that they normally are doing in their business… those things that make money for them and for the business. So, in reality, there really are a couple of logical arguments for and against when you discuss this topic. Sadly though, logic can’t be used to match reason and emotion. As a business owner, why would you really expect your staff to study in their own time for nothing, while you and your business will benefit from those staff having increased their knowledge? My personal belief is that the business owner should be paying EACH of their staff whenever any of them go beyond their regular hours in the name of improvement that the business owner and their business are actually going to be benefitting from. In the instance that I just mentioned, a dentist and his employed hygienist had come to a misunderstanding about payment to the hygienist for hours spent studying after hours on her own time, doing courses and modules provided for and paid for by the dentist. Sadly, because of this Mexican Standoff and misunderstanding between the two, it is my opinion that this relationship between the dentist and this particular hygienist will never be mended. And it is absolutely stupid and unreasonable. How many tens or hundreds of thousands of dollars of co-diagnosed treatment do you think that hygienist is now not going to bother to present to the dentist during patient examinations, because she perceives her dentist as being a tight and mean old man? As if the dentist’s actions in this instance are not enough, how do you think the hygienist feels seeing her dentist cruising around in his European sports car, living it up in his high-class super mansion and jetting off to some tropical oasis with his nuclear family, while he expects the hygienist to be putting in the study yards back home on her own time? “What gets rewarded gets repeated and gets improved upon”. Pay them to study, and reward them for doing so. You will make that investment back in spades…. This is really a common-sense discussion that should never have even made it out of that particular dental office. I’m wondering what the super hygiene coach who sold off this programme to this doc told him to do about reimbursing the hygienist for her time in this situation? My next public speaking presentation showing Dentists how to grow their Dental practices will be in Dallas Texas on Friday November 3 2017 with Jayne Bandy. For more information and to secure your seat click this link here. I will also be presenting at a Symposium on growing your Dental Practice in 2018 in Sydney Australia on Saturday December 2 2017 with leading experts Kinnar Shah, Angus Pryor, Jayne Bandy and Toni Surace . It’s Easy To Make A Difference For The Better. Service is defined as the ability to put the wants and needs of others ahead of those of ourselves. Whenever our clients, patients and customers feel that they are an inconvenience, then we have lost it. The reason our customers and patients leave our dental office and go elsewhere for their treatment is because of apathy and perceived apathy that they feel when they are at our dental offices. How is it at your dental office? When your valued patients call your dental practice do they get the feeling that your team have been waiting there in anticipation of their call? Or is it purveyed or implied to the caller that there are several other things going on at the office at that very moment that are probably more important than this incoming call? When your valued patients are brought out to the front after treatment are they greeted and welcomed there as if they were a long-lost friend, or are they made to wait in line until all of their information has been gathered or presented or has arrived electronically at the front office? Are your valued clients made to wait in line when it’s time for them to give you money? Are your valued clients asked to wait their turn before they are allowed to meet with the scheduling co-ordinator? Are your valued clients asked to sit quietly and wait until a treatment room is set up for them because your office does not have enough treatment rooms and staff for them to be seated inside in an operatory? Are your arriving patients greeted warmly by name at the front office before they even have the opportunity to identify themselves? And our patients spell service exactly the same way. Have you analysed every single little process in your business to see whether it can be improved upon from the patients’ points of view? I see so many dental offices where patients sit unattended and alone in treatment rooms. I see dental practices where patients being brought back to the front after treatment are greeted by an office manager multitasking on the phone and organising paperwork, when they really should be attending to that live person about to pay them money and schedule some more treatment. Looking after the needs of live patients should be the #1 priority. Nobody likes to be ignored. Being made to feel invisible is one of the rudest actions. Leave apathy well behind you. What is the true purpose of being in business? How do some people end up getting into their own businesses? Why are they in business? These are three very important questions that we need to ask ourselves on a regular basis. This is one of the reasons that people go into their own businesses. They do not like taking orders from someone else. They often feel that they are taking orders from someone who knows less than them, or someone who is taking advantage of their talents or their efforts. A feeling of being exploited, dare I say. They feel that they are the true star of the side, and they should be being rewarded in full, rather than in part. Their feeling is that if they are going to be putting in that effort anyway, then why not reap ALL of the reward for the effort rather than only a salary or a percentage? After all, if this idiot that I work for can own a business, then I can too, because I’m a lot smarter than them. And after all, how difficult can it be? All you have to do is sit back and count the money. There is a reason to be in business. The number one reason to be in business is to create an income that allows you to live comfortably while working and provide for you and your family so that you live comfortably in your retirement. As mentioned earlier, there is the potential when owning a business to be rewarded more for your efforts than if you were working only as an employee. With that income and extra income you can also invest [and therefore provide for others] such as in real estate or in other businesses. You can also direct money towards good causes that need a helping hand. You can consume more, and therefore pay more taxes. Tax money primarily is spent on welfare and infrastructure. Are you ready for the ups and downs of business? A salary provides a consistent income. A business can provide you with a variable income stream, depending upon seasonal and cyclical factors of influence. The highs may be good. The lows may not be so good. You’ll have good employees and bad employees. You’ll have good employees leave and you’ll have bad employees stay on and on and on. You’ll have bad employees cause good employees to leave. You’ll have employees cause good customers to go elsewhere. You’ll have employees who will help retain customers and employees who, in their own right, will attract customers to your business. Are you ready to manage other people? Know the results that you want from your business and then build that business to achieve those results. Most people do the opposite. They go into business and see what the business can do for them. It’s like jumping into a car, and driving, and seeing where the car goes, and that’s where you’re going to spend your vacation. Plan your life, plan your business, as if you were planning your vacation. Know where you want your business to take you. Know your desired outcomes. Know your desired path. The purpose of being in business is to receive a desired outcome. Being in business gives you more control and more choices. Are Your Team Members Guilty Of Oversharing? Last week I mentioned the dental office where I saw and heard two receptionists talking out loud in a negative way about a third dental employee, right there in front of patients seated there awaiting transfers to the treatment rooms. 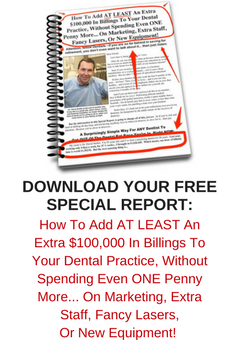 This is not a “good look” for the dental office to be showing their paying customers. There is a time and a place for saying everything. However, there is no place to be talking negatively or derogatively about someone else who is not present. In a similar vein, there is no place for oversharing negative information *with* clients and customers. There is absolutely no point and no benefit to the business for customers to hear of the trials and tribulations of what goes on and can go awry in the day to day business of going about business. Customers don’t want to know what has gone wrong. For the dental customer, it’s the exact same feeling as when you are sitting onboard your aeroplane waiting for it to depart and take off, and the pilot comes over the PA with a message about a warning light that has come on, and that maintenance has been called to check on the problem. I don’t know about you but I just want to believe that the thing [aeroplane] is airworthy and it’s going to get me safely to my destination, warning lights or no warning lights. I don’t care. Just get me there. Last week in England my wife and I dined at well rated restaurant in Yorkshire. The restaurant was very well presented and looked exactly how we would expect a fine dining establishment to look. The wait staff that attended to our table throughout the meal were in every way both professional and friendly, displaying a perfect mix and balance of each at all of the correct times. The restaurant was housed in a small cottage. This meant that diners were accommodated in several different smaller rooms within the building, rather than in one large dining area. On this evening, our table was located nearby to the doors of the kitchen. As is customary in a restaurant, there were two kitchen doors. One door for wait staff entering the kitchen and the other for wait staff leaving the kitchen. As each of the doors opened we were occasionally privy to the hustle and bustle going on inside this busy kitchen. My wife and I were surprised to hear these words coming from the kitchen, as was one of the wait staff out in our dining room, who immediately raced into the kitchen to speak with the waitress. The fact that one diner was not happy with the preparation of her meal was really no business of anyone else in the restaurant, and nobody else needed to hear this. What this waitress needed to have done in this instance was to firstly wait until the door behind her had closed, and then speak less loudly to the appropriate person rather than to the entire kitchen staff. These, and other similar comments of negativity, do nothing at all to build customer loyalty. There is no point in gossiping. There is no point in oversharing. Are All Of Your Employees One Hundred Percent Committed? From time to time the question arises about staff and their roles at the Dental Office. What are the roles *specifically* of each and every member of your dental team? Do you have clearly defined job descriptions for each and every team member? Does each team member know exactly what they are meant to be doing at each and every moment of their working day? I’ve seen some businesses where team members have “moments” in their day where they appear lost for something to do. Have you ever seen a business like that? The reason these staff are unsure of their roles is because their roles have not been clearly defined, and also because the staff are not being held accountable for their actions at all times during the working day. The best job descriptions are clearly defined in writing. Bad job descriptions rely on the spoken word only and memory. Even worse job descriptions are “made up as we go along”. If someone is being paid money for their time and labour then during that time they need to have clearly defined roles, tasks and accountabilities. When those roles and tasks and accountabilities are completed then the employee receives payment for their efforts. Customer time vs Non-customer time. This is often a point of conjecture in businesses. What should the employees be doing when there are no customers around to be served. Does your business have clearly defined tasks for employees to complete when there are non-customer times? If employees are being paid salary during non-customer times then it would be expected that they should be happily completing tasks that need to be done at these times. Nobody likes to see employees of any business standing around in groups having a chat when customers are arriving to be served or are inside the business and needing to be served. Have you ever been on an aeroplane and needing the attention of a flight attendant during a quiet time and felt as if you have been an interruption to them? When they are being paid to be looking after you and looking out for you? Have you ever walked into a retail outlet and seen two or more employees having a chat about anything rather than being one hundred percent there in the moment ready to help you with your visit to their store? I once saw a dental office where two receptionists conducted a negative conversation about a third team member right there out loud in the reception area in front of patients seated and waiting there to be called to the treatment rooms. Employees carrying and viewing their personal cellphones and devices during paid working hours is purely and simply theft of time and money from their employers. While an employee is being paid by an employer they should not be on their personal devices viewing messages, emails and social media. There are thirty-eight hours of the week that a full-time employee is paid to work. There are another one hundred and thirty hours of the week that that employee can then do whatever they want. And usually they do whatever they want during that one hundred and thirty hours with the money they have earned during the thirty-eight hours. Employees should not be bringing activities of the one hundred and thirty hours into the paid thirty-eight hours. I talk about the importance of these three words in our communications with our patients so that the patients know exactly what we need to be doing next for them. These three words are just as important when we are allocating and delegating duties for our employees. We need to make sure that our team members are totally clear about what they need to be doing at all times during the working day. Great businesses have this covered. Are you operating a great business?